Donald S. Dawson, who as a presidential aide marshaled Harry S. Truman's crucial whistle-stop tour in the 1948 election campaign and who later had a long career as a Washington lawyer, died on Sunday at his home in Bethesda, Maryland. He was 97. Mr. Dawson was personnel director of the Reconstruction Finance Corporation, created by the government to help fight the Depression, when Truman took him on in 1947 as a special executive assistant. He became perhaps the nation's first modern political advance man, acting as ubiquitous scout and troubleshooter, a master of the subtle but insistent politics that characterized the president's bid for a full term in the White House and became essential ingredients for many other successful campaigns thereafter. The whistle-stop that Mr. Dawson organized and commanded was a 22,000-mile cross-country stumping on the rails in which Truman, widely expected to be defeated by the Republican challenger, Governor Thomas E. Dewey of New York, gained victory with a relentless attack on the Republican-controlled Congress. "My job was to be a jump ahead, getting kids out of school early, finding free buses, whatever it took," Mr. Dawson told The New York Times in 1992, reminiscing in his law office a short walk from the White House. "When the president caught up with me at each stop, I'd brief him on the local situation, and he'd quickly adapt his direct comments. His spur-of-the-moment stuff was so good. He always wanted to talk about things the people wanted to know. Wonderful." "If the boss saw 20 people out of the window, he'd stop the train," Mr. Dawson told his interviewer. "The back platform of the train is where he really hit the people. Off the cuff, he was the best. And he was never afraid of politics." For his role as advance man, Mr. Dawson had already proved quick enough on his feet. There was, for instance, the time that Truman was to speak at Soldier Field in Chicago, where reserve seats were being sold so spectators could also see a Shriners' parade that was to end there. In an oral history on file at the Truman Museum and Library, in Independence, Mo., Mr. Dawson said he had soon realized that he would have a hard time filling the stadium. "I found that 4 o'clock Thursday afternoon was not really a popular time for people to take off from work and spend 5 or 10 or 15 dollars for a seat to hear the president of the United States," he said, "so that sales were going slow." But he arranged for the schools to be let out early, recruited people to fill empty seats without paying, cut off other empty seats with a huge American flag and locked in the parade's marchers so they all had to stay for Truman's speech. The stadium looked very full indeed. Donald Shelton Dawson was born in the western Missouri community of El Dorado Springs, graduated from the University of Missouri in 1930 and received his law degree from George Washington University in 1938. By that time he had worked for five years as an examiner for the Reconstruction Finance Corporation, created late in the Hoover administration to make emergency loans to help stimulate commerce. He was named the agency's director of personnel in 1939 and, after wartime service in the Army Air Forces, returned to that post in 1946. By then politically well connected, he was called on by Truman, at first to handle the tactful allocation of federal office space. Personnel again became a special responsibility, though, including assistance in presidential appointments. For a time, he was also chairman of the White House Loyalty Review Board, created by Truman to oversee loyalty investigations of government employees at a time when national affairs were increasingly dominated by fear of Communist subversion. In 1951, Mr. Dawson was caught up in Congressional inquiries into the financing agency and its board, accused of having been a central figure in a "web of influence" over the disbursal of jobs and loans. Truman at first resisted requests that a member of his personal staff be sent to testify, but later relented and let Mr. Dawson answer questions from a committee led by Senator J. W. Fulbright. Mr. Dawson never faced formal charges. He faded from the headlines and continued working at the White House. Then, with the end of the Truman administration, he became a senior partner in the law firm of Dawson, Griffin, Pickens in 1953. He assumed the same position with Dawson, Riddell, Holroyd, Taylor & Davis in 1968, went into solo practice in 1980 and, according to his family, worked from home till the end of his life. Among the interests in which he was active over the years were the Truman library, where he served as president of the Institute for National and International Affairs; the Humane Society of the United States; the College of the Virgin Islands; the Dwight D. Eisenhower Society; American Friends of Jamaica; and the American Arthritis and Rheumatism Foundation. He retired from the Air Force Reserve as a Major General in 1970. Mr. Dawson is survived by his third wife, Virginia J. Friedland, whom he married in 1975; two daughters, Diana Star Coyner Dawson of Boca Raton, Florida, and Virginia R. Fox of Manhattan; a son, Robert H. Fox of West Palm Beach, Florida; four grandchildren; and one great-grandson. His first marriage, to Alva Ansley Patten, ended in divorce. 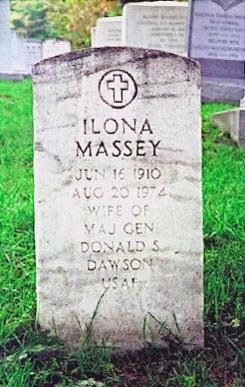 His second wife, the actress Ilona Massey, died in 1974. Donald Shelton Dawson, a lawyer who worked as a special assistant to President Harry S. Truman, died Sunday after suffering a stroke. He was 97. Dawson died at his residence in the suburb of Bethesda, Maryland, said a grandson, Chris Coyner. 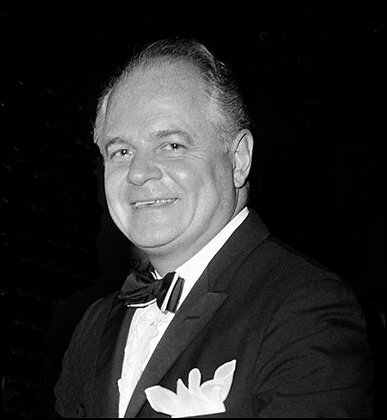 Donald S. Dawson, special executive assistant to President Harry S. Truman, is shown at a Washington charity event on Dec. 30, 1959. Dawson, 97, died of a stroke December 25, 2005, at his home in Bethesda, Maryland. He was one of the architects of Truman's 1948 whisle-stop presidential campaign, and after the election he was made responsible for all presidential appointments. Dawson, a lawyer, retired from the Air Force Reserve in 1970 as a Major General. He will be buried in Arlington Cemetery. As administrative assistant to Truman from 1947 to 1953, Dawson was responsible for all presidential appointments. In 1948, he helped organize Truman's whistle-stop presidential campaign and served on Truman's election strategy board. He also was chairman of the White House Loyalty Review Board, which was established by Truman to oversee federal loyalty investigations of government employees. Dawson is survived by his wife, Virginia J. Dawson, two daughters, a son, four grandchildren and one great-grandchild. Sultry, opulent blonde Hungarian singer Ilona Massey survived an impoverished childhood in Budapest, Hungary to become a glamorous both here and abroad. As a dressmaker's apprentice she managed to scrape up money together for singing lessons and first danced in chorus lines, later earning roles at the Staats Opera. 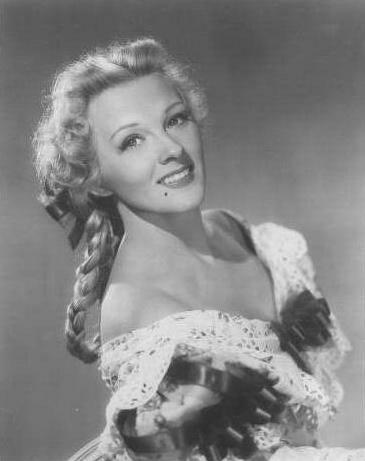 A Broadway, radio and night-club performer, she appeared in a couple of Austrian features before coming to America to duet with Nelson Eddy in a couple of his glossy operettas. In the first, 'Rosalie' (1937) , she was secondary to Mr. Eddy and 'Eleanor Powell' , but in the second vehicle, Balalaika (1939), she was the popular baritone's prime co-star. Billed as "the new Dietrich," Ms. Massey did not live up to the hype as her soprano voice was deemed too light for the screen and her acting talent too slight and mannered. She continued in non-singing roles in a brief movie career that included only 11 films. For the most part she was called upon to play sophisticated temptresses in thrillers and spy intrigues. Frankenstein Meets the Wolf Man (1943) and Love Happy (1949) with the four Marx Bros. are her best recalled. She appeared on radio as a spy in the Top Secret program and, on TV, co-starred in the espionage series "Rendezvous" (1952). In the mid-50s she had her own musical TV show in which she sang classy ballads. She became an American citizen in 1946. Married four times, once to actor Alan Curtis, Ms. Massey died of cancer in 1974. Major General Donald Dawson, USAF (Retired) (1955 - 20 August 1974 until her death.